Kit includes a Baja Designs headlight in red, LED taillight, brake switch and bracket, handlebar mounted high/low/off switch, and custom plug-in wiring harness with incorporated taillight power leads. No stator rewinding or modifications required. 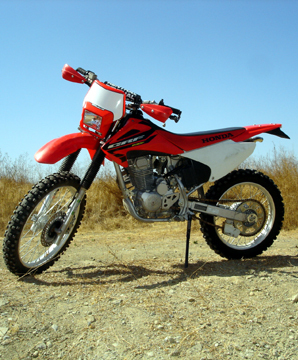 Note that the stock CRF230 stator can only effectively power a 35W headlight bulb. Baja Designs can rewind the stator for more output if you wish to run a more powerful 55W bulb.